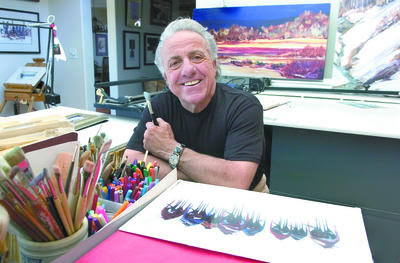 Ed Posa has developed over the years a unique style of characterizing the authentic American Southwest. Posa's use of vibrant watercolors and gouache creates an image by blending traditional Old World southwestern themes with contemporary colors and dramatic impressionistic concepts. His mystical Native Americans’ and sweeping vertical skies have become a trademark and are seen in many of his works throughout the world. Born and raised in Brooklyn, NY, Ed has been painting since his childhood. He attended the University of Wyoming on a football scholarship and became an educator, meanwhile for thirty years, coached high school football in Pueblo,CO and worked with special needs children of all ages. He was named Colorado Coach of the Year in 1967, and in 1981 received the Service to Mankind Award, a richly deserved and cherished honor emanating from his warm personality and genuine caring for others. The works of Ed Posa are true masterpieces of imagination and skill. His original watercolors are now on display at fine art galleries throughout the US, and many of his works are available in limited and open edition prints. Ed’s artistic reputation continues to increase with each passing year. He is represented by over 25 galleries spanning all of North America, has been featured in numerous publications and is included in many prestigious collections.